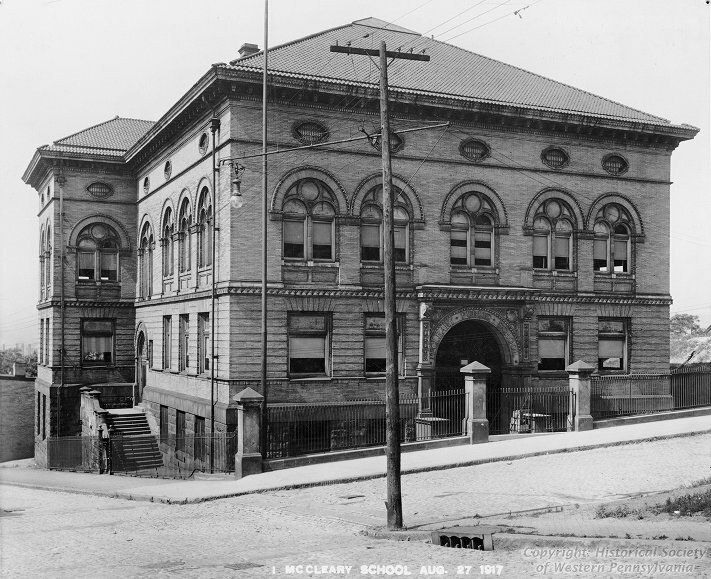 The McCleary School, named in honor of Miss Rose McCleary, principal of the entire *Mt. Albion Sub district was built in 1900 on the corner of McCandless Avenue and Holmes Street in Pittsburgh’s Lawrenceville Neighborhood.Several Pittsburgh teachers and one Harvard University professor are counted as McCleary alumnus. In an effort to bring costs and per-pupil costs down, McCleary School was closed in 2002. The original McCleary School design included an open court first floor, marble stairways, a glass dome and ornate metalwork. Many of these architectural details are still intact today and are some of the building’s most beautiful and most beloved features. * The Mt. Albion Sub district included the following local schools: Sunnyside, Mt. Albion, Morningside, McCandless and McCleary.